The Scuderia Ferrari Orologi collection is introducing a new family, Forza, for the Spring/ Summer 2018 season. May 09, 2018 - Dubai, UAE: Forza captures the true racing spirit of Scuderia Ferrari with its race-car inspired details. 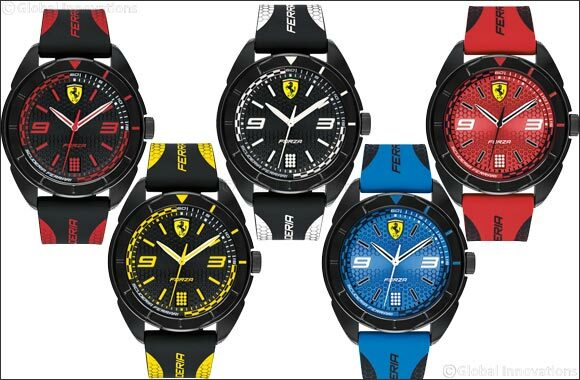 This 45mm 3-hand watch features a textured dial offered in a range of bold colors, including black, red or blue colored dial, with large Arabic numbers at 3 o'clock and 9 o'clock, the font is found on the nose of the Scuderia Ferrari F1 single seater. To add even more dimension, a checkered flag detailing is found stretching from 3 o'clock to 6 o'clock and 9 o'clock to 12 o'clock. Topped off with a yellow Scudetto at 12 o'clock and a car dashboard inspired minute track running from 12 o'clock to 3 o'clock, this new family is perfect for the true Scuderia Ferrari fan, Powered by a 3-hand quartz engine. The watch is offered on a black, red or blue free-falling silicone strap. Water resistant to 30 meters/3 ATM. 2-year limited international warranty. Priced at AED 415, the collections is available across Hour Choice stores in the UAE.